Palliative care requires time-intensive services by a variety of team members. While this care delivery results in great value, palliative care teams do not always get paid in relation to the value they create. 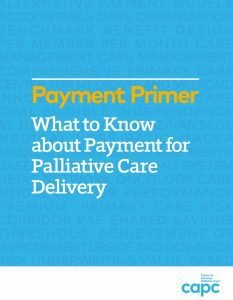 To address this challenge, the Center to Advance Palliative Care (CAPC) has created and released the Payment Primer: What to Know about Payment for Palliative Care Delivery. The Primer is a free CAPC resource available to any program interested in payment but not sure where to start. It provides a basic foundation in health care payment insurance structures and quality metrics and offers ways to identify opportunities for payment improvement.